That was then, the beginning stages of the process where Covington endured a 10-win season and the two longest losing streaks in NBA history. And this is now, the No. 3 seed in the NBA playoffs with the Sixers beginning play at home on Saturday against the Miami Heat. The Sixers clinched that seeding with a 130-95 win over the Milwaukee Bucks on Wednesday to end the season with 16 consecutive wins, the longest winning streak to end a regular season in NBA history. A lot of people suffered during the journey since the Sixers’ last trip to the playoffs in 2012, but none more than Covington. He and T.J. McConnell are the only current Sixers who played on that 2015-16 team that opened the season with 18 straight losses (a record to start a season), which followed Covington stomaching an 0-17 start to the season the year before. Covington was there for the duration of those NBA-record 28 consecutive losses, and was a participant during the 2015-16 season in which the Sixers won 10 games. But, initially, he wasn’t likely going to be a big part of it. “The Process” was a chess game, a strategic endeavor launched by former general manager Sam Hinkie intended to snag high draft picks such as Joel Embiid, Ben Simmons and Markelle Fultz and not guys who were undrafted and unheralded like Covington. Philadelphia 76ers forward Robert Covington (left) does a shooting training drill with All Around Basketball trainers Spencer Richardson (center) and Jamal Richardson (right) during a late-night workout at the Sixers Training Complex in Camden, New Jersey, on April 7. The Nashville, Tennessee-based trainers and cousins have been working with Covington since his days playing at historically black Tennessee State University in 2013. Covington may not have been a mere pawn — we’ll save that description for guys such as K.J. McDaniels, Hollis Thompson and Henry Sims, who were among the unknowns to start games for the Sixers during the 2014-15 season. But he was, at best, a knight, a roster piece easily sacrificed whenever the Sixers, described during the early stages of “The Process” as being “anti-competitive,” could position themselves to snare a first-round pick. Covington never bought into that narrative. Instead, Covington saw his arrival in Philadelphia as an opportunity, and he took his job seriously enough during the dark days of accepting “L’s” to emerge as a significant player on the NBA’s most surprising team this season. Covington has become a 3-point threat on offense and one of the league’s toughest defenders. His active hands and 7-foot-2 wingspan helped him end with the league lead in deflections for the second straight season (he averaged 3.9 this season, tied with Paul George). Ah, yes, the postseason. And for the time it’s taken Covington and the Sixers to get here, they’re not content to just make a brief cameo. 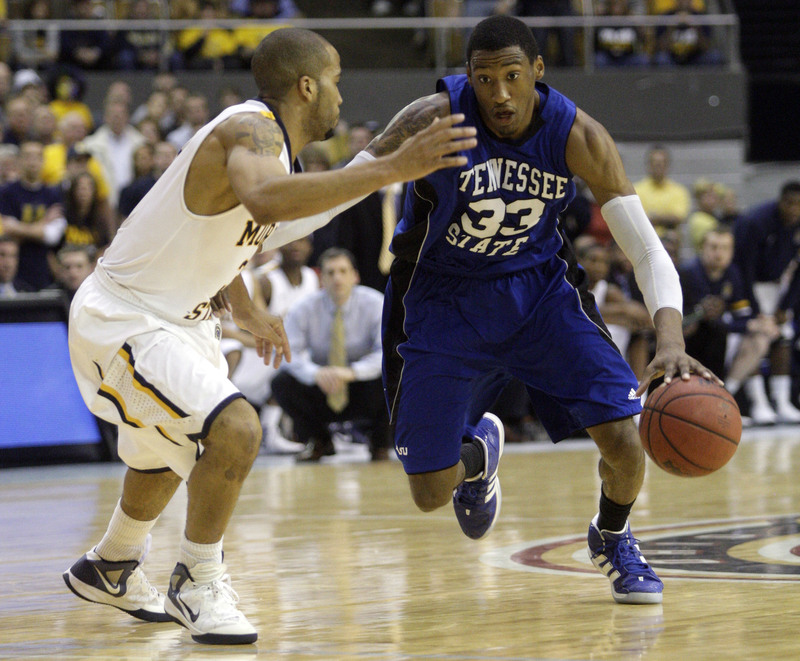 Tennessee State’s Robert Covington (right) drives as he’s defended by Murray State’s Jewuan Long in the second half of the championship game at the Ohio Valley Conference tournament on March 3, 2012, in Nashville, Tennessee. Covington’s dad recognized his greatness early. Dennis Bryant had taped his 10-year-old son shooting baskets, and when he returned to their home in Bellwood, Illinois, to watch the workout, he excitedly called out to his wife, Teresa. “He’s got it, he’s got it,” Dennis Bryant yelled as he kept rewinding the tape. “He’s got what?” Teresa Bryant responded. Parental adulation didn’t translate to basketball success. At least not immediately for Covington, a skinny kid who was cut from his grade school and middle school basketball teams on three occasions. Snubbed by the school, Covington went the AAU route, and once he got to high school he was quickly embraced by his coach, Kevin Dockery, who looked past the rail-thin ballplayer and saw some of the same qualities that Dennis Bryant had spotted on tape. As a freshman at Proviso West High School in suburban Chicago, he shot up from 5 feet, 9 inches to 6 feet, 3 inches, and school coaches suddenly began to take notice. But in a day and age when kids are born with an apparent green light to shoot, both Dockery and his high school coach at Proviso West, Tommy Miller, discovered their best shooter was a reluctant gunner. By his senior year in high school, Covington had grown to 6 feet, 8 inches and showed his versatility, averaging 18.1 points, 11 rebounds and 7 blocks per game. He was the West Suburban Conference Player of the Year and led Proviso West to the West Suburban title, but by the end of his career he had just two college offers, from Sacramento State and Tennessee State. Tennessee State’s interest didn’t come under ideal circumstances. Then-coach John Cooper traveled to Illinois to see Covington in an organized pickup game at the recommendation of his assistant coach, Dana Ford. But when the two arrived at the gym, there weren’t enough guys for a full-court scrimmage, forcing the two coaches to make an evaluation from a few half-court games. When basketball practice began, Covington often participated in rebounding drills against upperclassmen who outweighed him by more than 50 pounds. Covington laughs when he hears those words and is asked what they mean to him. Covington scored 21 points in his college debut against Siena and by season’s end was the team’s second-best scorer (11.5 points per game) and top rebounder (6.5) on the way to being named the Ohio Valley Conference Newcomer of the Year. Suddenly, the Division I schools that ignored Covington coming out of high school had an interest. He stayed at Tennessee State, where his game continued to develop. 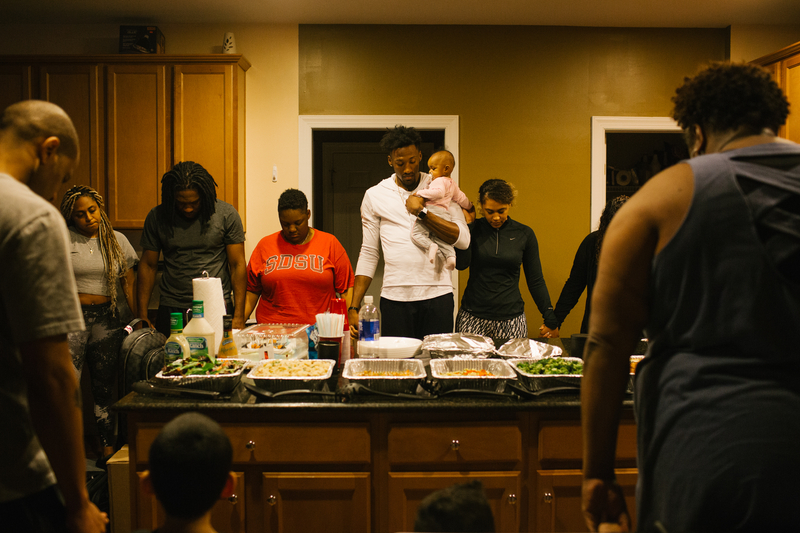 Philadelphia 76ers forward Robert Covington, 27, holds his 8-month-old niece, Aniyah, as his family and friends pray before dinner at his home in Mickleton, New Jersey, on April 7. Covington finished his college career seventh on the school’s all-time list in points (1,750) and rebounds (876). During his best college season as a junior, Covington averaged 17 points and 7.9 rebounds and shot 44.8 percent from 3-point range. All that earned him a snub from the 2013 NBA pre-draft combine in Chicago, even though he eventually received a late invitation. Covington was confident he’d be drafted, based on conversations his agent was having with teams. On draft day he had just flown back from Cleveland, where he had a workout with the Cavaliers, and arrived just in time for the party his parents hosted at a local hotel. But by night’s end, after he spent the entire draft speaking to various teams, his name was never called. That deal with the Rockets was a partially guaranteed two-year deal that led to Covington spending most of the 2013-14 season with the Rio Grande Valley Vipers in the D-League (now the G League). He cherished the six call-ups to Houston, where he had a chance to practice with and learn from NBA players. Which proved true by the start of the 2014-15 training camp when Covington, who signed that multiyear deal with the Rockets, was waived. 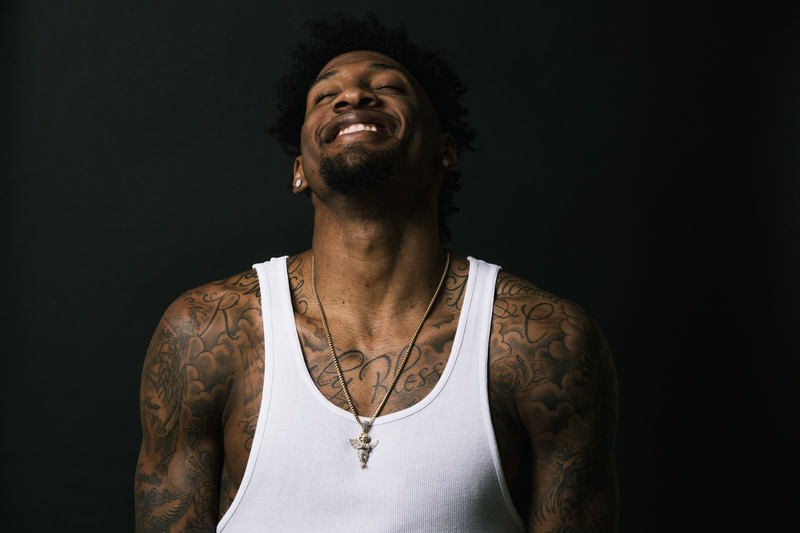 Robert Covington sits down with Jerry Bembry of The Undefeated to discuss his love of reptiles, and introduces his 3-foot pet python, Max. Eight days after being released by the Rockets, Covington was selected with the first overall pick of the D-League draft by the Grand Rapids Drive, an affiliate of the Detroit Pistons. Heeding Howard’s advice, Covington kept grinding. He never let himself get comfortable. He never allowed the losing streak to get to him. And he never let the abuse from frustrated fans get to him (except that one time). So Covington kept his head up through the booing, never glanced over at the fans who showed up at games with bags on their heads and didn’t pay attention to the empty seats. Considering the reputation of Philadelphia fans, the reaction to the team could have been worse. Many fans actually embraced “The Process” and were thrilled when the losing allowed the team to add pieces who they thought would turn out to be good (Nerlens Noel and Jahlil Okafor) and those franchise-changing players who actually have talent (Embiid, Simmons and Fultz). And here we are: The Sixers are in the playoffs with the players built through “The Process,” but without the man, Hinkie, who put the plan in place. Asked about Hinkie’s departure, Covington leans back in his chair and thinks on it for a second. 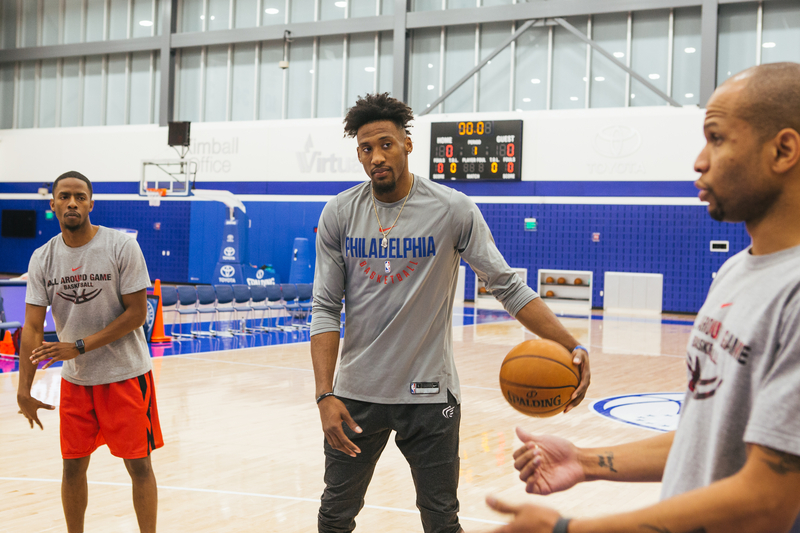 Philadelphia 76ers forward Robert Covington (center) listens to his trainers Jamal Richardson (left) and Spencer Richardson (right) during a late-night workout at the Sixers Training Complex in Camden, New Jersey, on April 7. It’s approaching 10 o’clock on a Saturday night in New Jersey and a four-car caravan led by Covington travels east on I-76 toward the Walt Whitman Bridge. The bright lights of Philadelphia are enticing, and surely on the other side there’s a nightclub or bar that would gladly comp Covington’s crew and raise a glass to the guy who battled LeBron James the previous night in a win that set in motion the Sixers clinching the No. 3 seed five days later. But Covington turns north before he reaches the bridge and heads north toward Camden. After a few turns through downtown, he leads the caravan through the security gates of the Philadelphia 76ers’ practice facility. Since high school, Covington’s lived by the motto that attached to all of his social media profiles: ATF, or allergic to failure, a line from a Lil Wayne that fills his headset before every game. That’s why, on this night, Covington’s choosing to practice and not party. His trainers, Jamal Richardson and Spencer Richardson, have flown in from Nashville, Tennessee, to help get Covington’s body right for the final stretch of the season. After Covington’s deal was announced, Sixers coach Brett Brown, who arrived at the beginning of “The Process,” praised the move. Seize the moment. The late-night drive to the Sixers’ practice facility is the conclusion of a long day for Covington. The previous night he was in Cleveland hounding James in Cleveland. He arrived overnight and got up early to spend the afternoon at the Adventure Aquarium in Camden with family and friends. Then he took time to provide a little TLC to his 3-foot python, Max, and two iguanas. Then it was dinnertime with his friends and family — his parents and siblings are all in town — that’s prepared by his chef. At the gym, Covington is run through a nearly 90-minute session that includes sets that are designed to simulate the shots he gets in the Sixers offense. With $62 million in the bank and a playoff berth locked up, it would be easy on this Saturday night to be across the water, where there is some serious partying in large sections of Philadelphia. For Covington, the social scene can wait. His desires are bigger than chugging beer and table service. “The Eagles won the Super Bowl and Villanova won a championship,” Covington said. “So why not us?